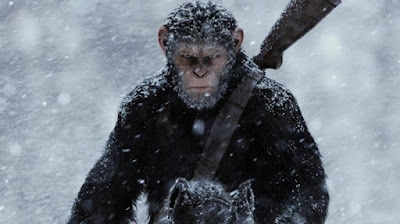 WAR FOR THE PLANET OF THE APES is an emotionally affecting, visually impressive, intelligent conclusion to the new trilogy of films that began with RISE and more recently DAWN. As the film opens we find our sensitive ape hero, Caesar (Andy Serkis) holed up in a forest, fighting off incursions from the Colonel's soldiers. The apes position is unsustainable, so Caesar entrusts his best friend Maurice to lead the tribe to a promised land across the mountains (very deliberate biblical parallels here). Meanwhile Caesar and a handful of followers goes on a revenge mission. Along the way he encounters a young mute girl, who we will learn will become the future Nova (for those familiar with the Charlton Heston movie) and a tragicomically traumatised monkey called Bad Ape (Steve Zahn). The bulk of the movie is, then, set in the ape prison camp run by Woody Harrelson's Colonel. We see infiltration, capture, and escape plans hatched and dramatic action sequences. The resulting film is brilliantly nuanced and resonant. Caesar is our hero, but he's guilt-ridden for killing his militant ape enemy Koba in the previous film. We also have to consider the conflict between the needs of his tribe for a leader and his need for personal vengeance. The Colonel is similarly nuanced despite an exaggerated performance, deliberately echoing Brando as Colonel Kurtz. As the movie progresses we learn that he too is under threat for taking harsh and perhaps justified decisions that parallel Caesar's decision to kill Koba. And, in observing the Colonel's fate, one can't help but suspect that maybe he was right. There are certain aspects of this film that I suspect everyone will like. The cinematography is spectacular. The mist rising from the forest - the green gun lights shining through a waterfall and into a darkened cave - apes on horses riding across a beach in the morning sunlight reflected in the ripples of sand. And it's hard not to get drawn into the trials of Caesar - a character we have come to know and love over three movies, and to be affected at the mutual admiration between Caesar and Maurice. As for the rest, it will very much depend on your tolerance for the broad strokes of "big" cinema. I have also mentioned Woody Harrelson's literally cigar-chomping performance as the messianic cult leader Colonel. And little Nova is very much an angelic martyr to the genetic mutations that are now sweeping mankind after the Simian flu epidemic. But it's Caesar where the metaphors work hardest and loudest. He is cast as a kind of Christ, crucified on the prison frame, and then as a kind of Moses, leading his apes to the Promised Land. And then, along the way, we have echoes of prison films from KWAI to THE GREAT ESCAPE to UNBROKEN and Caesar as the beaten up hero of them all. I personally loved this recasting of the prison film genre with a sensitive and intelligent ape as the lead. But for some, this could become ham-fisted. WAR FOR THE PLANET OF THE APES is rated PG-13 and has a running time of 140 minutes. The film is on global release.